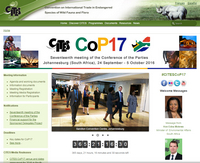 Geneva, 24 September 2015: In exactly one year’s time from today, the entire CITES community will congregate at the Sandton Convention Centre in Johannesburg, South Africa, for the 17th meeting of the Conference of the Parties to CITES (#CoP17). The meeting will run from 24 September to 5 October 2016 and a new dedicated portal for CITES #CoP17 was launched today. This portal will provide access to all CITES #CoP17 documents and relevant information concerning the meeting via one webpage. The CITES Secretary-General, Mr John E. Scanlon, visited the Sandton Convention Centre ‎in Johannesburg with Mrs. Edna Molewa, Minister of Environmental Affairs of South Africa earlier this month. The Sandton Convention Centre is a technologically advanced convention centre and is a superb location for CITES #CoP17, having state of the art facilities and being well located to the Johannesburg O. R. Tambo International Airport via a recently completed direct train link. The meeting will be the largest global gathering of people focused on wildlife trade, attracting CITES Parties, intergovernmental and international and national organizations, the private sector, local and indigenous groups, and experts from multiple disciplines. The meeting will review progress made since CoP16 in Bangkok in 2013, the future direction of the Convention, and proposals to include new species under CITES regulatory controls. Welcome messages from Minister Molewa and South Africa’s Black Mamba Anti-Poaching Unit were also posted today on the CITES #CoP17 web portal. The CITES Secretariat is in the process of mobilizing resources to ensure that all of the 181 Parties to the Convention are adequately represented at this crucial meeting through the CITES Sponsored Delegates Project. The Project aims to ensure the representation of least developed countries, developing countries and countries with economies in transition that do not have sufficient funds to attend the meeting. Through the project CITES can support the participation of two delegates. Full participation in meetings of the Conference of the Parties is essential to ensure that the recommendations and decisions that are agreed by consensus or voted upon reflect the views of a majority of CITES Parties. With 181 Parties, the Convention on International Trade in Endangered Species of Wild Fauna and Flora (CITES) remains one of the world's most powerful tools for wildlife conservation through the regulation of trade. Thousands of species are internationally traded and used by people in their daily lives for food, health care, housing, tourist souvenirs, cosmetics or fashion.